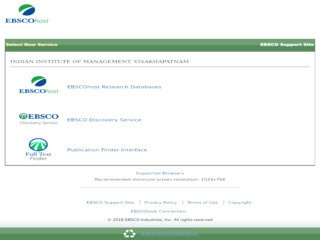 This is the world's definitive scholarly business database, providing the leading collection of bibliographic and full text content. As part of the comprehensive coverage offered by this database, indexing and abstracts for the most important scholarly business journals back as far as 1886 are included. In addition to the searchable cited references provided for more than 1,300 journals, Business Source Complete contains detailed author profiles for the 40,000 most-cited authors in the database. Journal ranking studies reveal that Business Source Complete is the overwhelmingly superior database for full text journals in all disciplines of business, including marketing, management, MIS, POM, accounting, finance, and economics. Additional full text content includes financial data, books, monographs, major reference works, book digests, conference proceedings, case studies, investment research reports, industry reports, market research reports, country reports, company profiles, SWOT analyses, faculty seminars (videos), and more.